Home appliances are crucial elements of any household. Each day, we rely on our home appliances to make many different household jobs easier to perform. Whether you’re cooking a delicious meal or cleaning clothes, the chances are that you’re using one of many common appliances that are a staple of modern living. When you experience issues with one of your home machines, it can be a serious inconvenience. 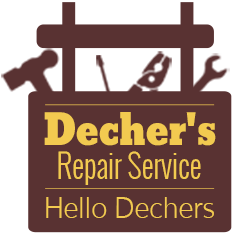 Fortunately, you won’t have to suffer for any longer than is necessary when you turn to Decher’s Repair Service for home appliance repair in Albany, NY. By choosing us for home or kitchen appliance repair, you can expect responsive service and long-lasting solutions from our team of highly trained technicians. Our repair company provides mobile appliance repair to fix a wide variety of domestic appliances such as dishwashers, refrigerators, ovens, and more. No matter what you’re experiencing, we’re confident we have a solution for you. Call us to put your repair needs in the capable hands of a professional, well-rounded appliance technician that you can rely on. Your home appliances work hard so that you can enjoy an easier everyday routine. However, malfunctions can take many different forms. Aside from failing to turn on, a broken unit can also exhibit poor performance and can increase the risk of property damage or health issues. Our appliance service covers a wide range of issues and equipment, so you can have confidence knowing that our help is easily accessible. Repairing appliances is a delicate craft that requires skill and attention to detail. Fortunately, our mobile appliance repair professionals have the expertise and knowledge necessary to fix your appliances properly the first time. At your request, our technicians will adapt to your situation to help you maintain the user-friendliness of your machines and the overall energy efficiency of your home. Our company is your go-to choice when you need appliances fixed. Call us any time day or night for effective and efficient repair services. We understand the frustrations that can mount when your appliances break down on you. That’s why we emphasize providing you with high-quality home appliance repair and attentive customer care. At your request, we’ll provide you with prompt, accurate repairs within your schedule and budget. Protect your property by taking advantage of our services today. Getting your appliances back into working order is what our team does best. That is why so many people turn to us when they are in need of top-quality appliance repair in Albany, NY. We have the experience, knowledge, and tools necessary to quickly get to the bottom of any issues you are experiencing with your appliances. When we are finished, your appliances are going to work just like new again. Delivering the best appliance repair to our customers is the foundation of our business. By delivering work that is second-to-none, we are able to not only save you money by fixing your equipment, but also by reducing the amount of time it takes to finish the repairs. The next time you are experiencing an issue with one of your appliances, do not delay in reaching out to our trained professionals . We are ready, willing, and able to provide the top-quality appliance repair you need at a very competitive price. Contact our company when you need your most important home appliances repaired today. With two offices, we proudly serve customers in Albany, Delmar, Slingerlands, Glenmont, and Bethlehem, New York.